(This is the first chapter of my upcoming book, with a working title of American Teen: 33 Strategies to Teach Teenagers Self-Reliance, Confidence, and Responsibility. I’ll post a few chapters here this year as it makes its way to publication). Did your parents say they loved you? Out loud? I don’t remember mine expressing love that way more than occasionally. They showed it all the time, but they didn’t say it much at all. Maybe just my family or their generation didn’t verbalize love well. Let’s make sure this generation hears it more. We all want to feel loved. It’s one of the most basic human needs. Right up there with air, water, and food. Most children know, deep down, that their parents love them. But they also want to hear it, continually. Knowing that they are loved boosts their outlook, elevates their mood, and instills them with pride and self-esteem. You may never have actually heard God speak words of love to you—in an audible way. (Or maybe you have, halleluiah!). But you’ve read about the many ways Christ expressed his love throughout the Bible. That’s pretty much the main theme of the whole book. Love. Find ways to express your love verbally to your child—and don’t quit when they become teenagers. Around the age of ten some boys may turn away when you try to hug them or not acknowledge when you say you love them. But it doesn’t mean they don’t want to hear it. Girls at that age typically still like hugs, but as they approach the teen years, it suddenly may become “uncool” to receive affection from mom or dad in front of their peers. Parents go from cool to lame pretty quickly for some kids. The best way to express love is to verbalize it. Please don’t tell me you’re not the kind of person to say those things out loud. That doesn’t quite cut it with kids—or wives or husbands either for that matter. If you haven’t learned to express your love verbally…all I can say is…learn how to do it, now, please. I realize there are other “love languages” that we all can use to express love, including spending quality time and physical touch. This is not a book about learning how to verbalize your emotions, but if you don’t do that well, maybe it’s time to practice. Work together with your spouse, practice on your dog or cat, whatever it takes, learn to verbalize your love. Have heart-to-heart discussions with teens. Tell them how much you love them, especially after they make mistakes or are feeling down about something. Tell them that nothing they do will ever negate that love. Convey to them that you will love them no matter what. Don’t hold your love back until they fulfill some prerequisite. No “I’ll love you if” language. If you get good grades. If you love me back. If you do your chores. Or if you fulfill some promise you made. Don’t even infer this type of trade—exchanging your love for something in return. Because if you don’t receive that something, then you’ll continue to hold back that love. After you verbalize it, document it. Write them a card, a note or a letter with your love expressed. Something they can keep, and cherish, and refer to when it seems like you don’t love them. We’ve all read stories of dog-eared notes of love, affection or encouragement hidden in wallets or purses for decades. Kids keep these love notes because they make a profound impact on their lives. Don’t simply document it once. Send little notes or cards regularly and especially during those times when they’re vulnerable and need to hear it—and see it. 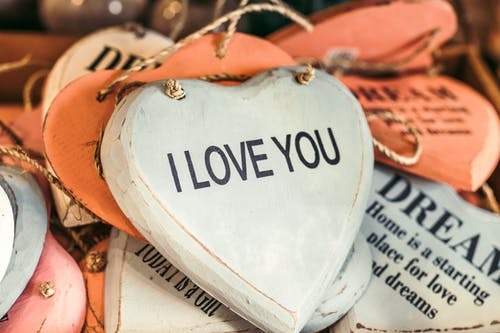 Make those love declarations a common occurrence and a unique treat. Tell them you love them consistently, every day. Make those more regular love announcements a practice. Do it frequently, either as a typical greeting each time you see them or a farewell when they leave the home. For example, each morning as they leave for school. Tell them at special times, too, when they aren’t feeling loved—when they are down, depressed, or defeated. Make it a point to pull them aside and one-on-one express your confidence in them and your unrelenting love. This is for their ears only—from your lips directly to their heart. Don’t get trapped into expressing love with presents or gifts. A new phone, a new outfit, even a new car. Here’s an extreme example. In the high school where my daughter attended, graduation presents for a very select few of the girls included…wait for it…breast augmentation. Seriously. The boys got new cars and the girls got new… looks. If your family is affluent and you have the means to give your children cars or other “gifts”, I’d like to recommend a great book. The Price of Privilege by Madeline Levine, Ph.D. The subtitle says it all: How parental pressure and material advantage are creating a generation of disconnected and unhappy kids. In the book, this clinical psychologist explodes various child-rearing myths and identifies parenting practices that are toxic to healthy self-development and contribute to an epidemic of depression, anxiety and substance abuse. Do not teach children and especially teenagers that objects like presents or gifts are a substitute for love. It never works; they’ll come to expect “things” and not love. Teach them to expect the verbal expression of love, a sincerity from the heart and not the pocketbook. Don’t overdo the gifts—overdo the love. When your child matured from birth into adolescence, you may have expressed your love in mostly tactile ways, like cuddling and hugging. Once children understand verbal language, the best way to teach them your love is by saying it. Out loud, often, and from the heart. When children feel loved, it’s a natural self-esteem boost. You won’t have to find many other ways to instill value in a child other than injecting them with undeniable and unrelenting love. Nice job, Bruce. I look forward to the book. I can relate to much of what you have said here, Bruce. I have twin girls who just turned 17. We are a household with very little disposable income, in a school district that is quite the opposite, so I see and hear about lots of lavish gifts. Many of the kids my girls know were given brand new BMWs at 16, just to have them totaled in car accidents, followed by another brand new car. The high school my kids go to is noted as one of the most beautiful in the country, yet it also has one of the highest suicide rate, and very low school spirit. I can’t actually quote the stats. My kids drive a beat up 1997 Honda which they share most of the time. I have often wondered what impact our financial struggle has on them. Mostly I see two girls growing up with very healthy attitudes and expectations. Yet I’m sure they still need to hear they are loved, often and thoroughly. Even though I am not challenged by the habit of using gifts to express my love for them, I don’t always remember to use my words. I enjoyed your blog post very much. Thank you!